There’s a feelgood feeling to Falling in Love with Frida [★★★☆☆], a dance/storytelling/physical theatre performance with neon cacti, bright yellow furniture, Mexican music and costumes, red flowers in the performers’ hair – even a shot of tequila given to the audience. Caroline Bowman bubbles over with joie de vivre. But anyone expecting this to be a serious study of the painter Frida Kahlo’s genius and suffering will be disappointed. This production is more about Caroline’s own journey to overcome her disability as a ‘small person’ as she calls herself, through her art as a performer and to rejoice in her love affair with a ‘tall person’, Susan. But incoherent storytelling leaves the audience confused. It’s not clear at first why there is a third performer. If Susan appears halfway through the story then why is she on stage from the beginning? Frida’s terrible injuries in an accident are only related halfway through, so earlier writhing choreography is mystifying. This wonderfully talented performer needs a director with a cold eye. Caitlin (★★★★☆) is harrowing physical theatre/dance, a brilliant and overwhelming enactment by Eddie Ladd and Gwyn Emerton of the effects of alcoholism, the life-in-death of Dylan Thomas and his wife, Caitlin. A poet famous for his extraordinary use of language, Dylan is reduced to mouth-popping. 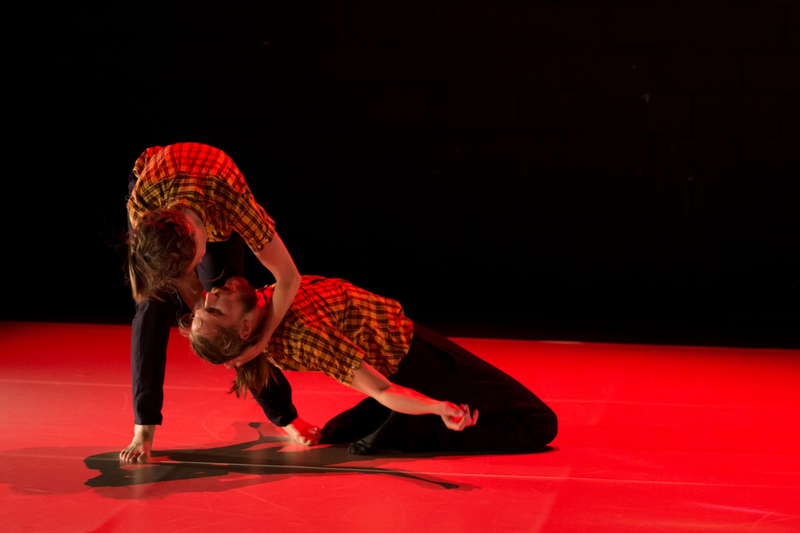 The couple fall, writhe and roll on top of each other, walk into walls and become entangled in chairs which increasingly symbolise their helplessness but despite it all, their love for each other. The electronic soundtrack, played live by Sion Orgon sampling tracks from the band Thighpaulsandra, adds to the visceral experience. A Must See show, but only if you are feeling strong enough to take it. Plan B for Utopia (★★★★☆) is a beautifully constructed show: laugh out loud, serious, profoundly silly, and a joy from start to finish. John Kendall and Solène Weinachter are not only emotionally insightful dancers but also skilled actors and comedians. Weinachter instantly builds a rapport with the audience that most stand-up comedians would give their arm for. There is real excitement in seeing artists going for the most ridiculously ambitious topic – Utopia: our longings and wishes for ourselves and for each other – and being able to pull it off. The mix of words and dance enhance each other superbly. A particular two minute dance from Weinachter creates an effect that is the equivalent of a whole Beckett play. Despite the topic, the show is hilarious – and honest. It presents no easy answers, but the conclusion is bittersweet rather than sad. This thoughtful and perceptive show will haunt you for days.